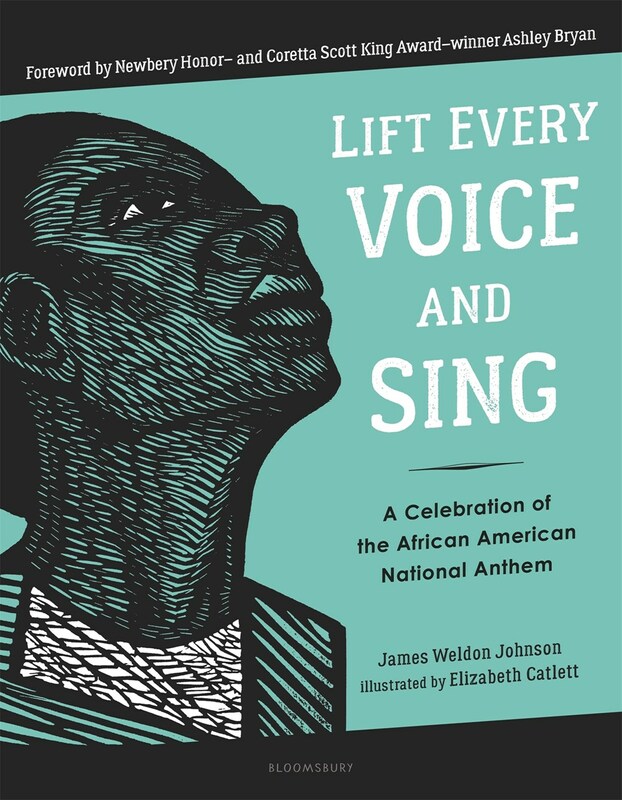 Lift Every Voice and Sing: A Celebration of the African American National Anthem by James Weldon Johnson and Elizabeth Catlett is now available in a in an updated edition with a forward by Ashley Bryan and a fresh new design. 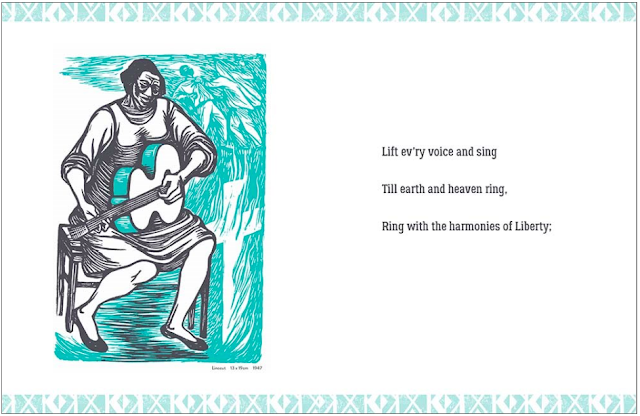 "Lift Every Voice and Sing" was originally written in 1900 by a schoolteacher and activist named James Weldon Johnson. The song was later adopted as the official African American national anthem by the National Association for the Advancement of Colored People (NAACP) and became a foundational hymn in churches all across America, chronicling the history of the black experience for more than a hundred years. 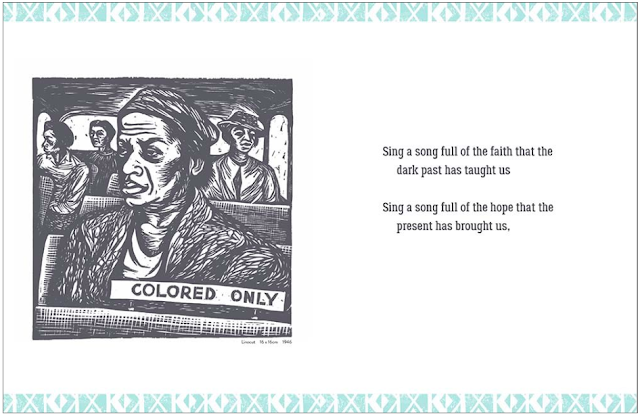 Illustrator Elizabeth Catlett, who passed away in 2012, was a Harlem Renaissance artist known for her depictions of the struggles of black people, especially women. She was the grandchild of freed slaves and devoted much of her career to teaching. Every page in this book is stark white, save for a thick block of text on the recto page, a single linocut on the verso page, and a decorative teal border across the top and bottom of each spread. The linocuts, which come in all different shapes and sizes, are arranged either in all blacks or teals and blacks. The monochromatic design of each linocut allows for harsher shadows and highlights to accent the wrinkles on peoples' brows and the sharpness of the barbed wire fences –– not to mention the sense of depth these tonal differences create. 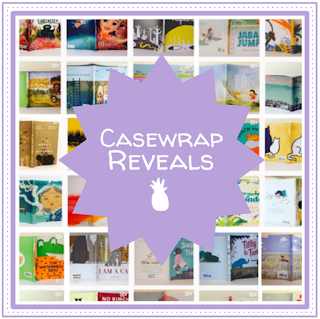 There's a sense of beauty and grit to each image as they capture the duality of the lives of each person, caught between a celebration of faith and the reality of discrimination. Lift Every Voice and Sing: A Celebration of the African American National Anthem published earlier this year from Bloomsbury Children's Books.